Jedi weapons are perfect for a system that lets you kill with one blow. FromSoftware developer Hidetaka Miyazaki says he wanted Sekiro’s combat system to centre on “swords clashing”. Instead of peeling off chunks of an enemy’s healthbar, you keep up the pressure until a deathblow opportunity appears. Then you execute your opponent with a stab and a geyser of blood. The system is very good at two things. Firstly, swords actually feel dangerous. Secondly, blocking can be an offensive action. A perfect parry mitigates damage, but it also damages the opponent’s posture bar and brings the deathblow opportunity closer. Though the sparks and clang noises are satisfying, the ‘swords clashing’ part isn’t just for show, it’s the core of every fight. The system is a great fit for Sekiro’s feudal Japan, but it also works in a universe where blades are made of searing energy, and where fights with those blades are based entirely on energy blades clashing in showers of sparks and cool sci-fi noises. It’s an unspoken law of the internet that lightsabers must be modded into every combat game possible. In this case I think that’s justified. Games like Jedi Knight have fun lightsaber combat that rewards player skill, but fights feature a lot of wild flailing that doesn’t fit the fantasy of films. Sekiro fights deliver challenge and spectacle. The combat system is also able to simulate both the lightsaber’s power and the Jedi’s agility. Dodging and jumping are still important actions in Sekiro fights and force-powered movement is a natural replacement for a shinobi’s crouching dodges and acrobatic wall-jumps. You would only need to tweak how direct damage looks. Lightsabers can nick a thigh or an arm, but much more and you’d expect limbs to start flying. The Star Wars universe also has a different take on gore. Dismemberment is fine, it seems, as long as there’s no blood. Lightsabers have always been a problem for games because they are supposed to cleave effortlessly through flesh, bone, and metal. The Star Wars universe has some handy workarounds, like vibroblades that can block a lightsaber swing. Games have also found ways to gesture at the lightsaber’s fabled power without actually letting you cleave levels to pieces. In Jedi Knight your lightsaber leaves a glowing molten trail when it clips through walls. It’s a small visual touch, but just enough to suspend disbelief. 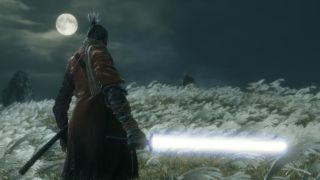 However, few games have managed to make the Jedi’s signature weapon feel as lethal as Sekiro’s sword. I hope future Star Wars games take note.